"Violence has declined over long stretches of time, and today we may be living in the most peaceable era in our species' existence. The decline, to be sure, has not been smooth; it has not brought violence down to zero; and it is not guaranteed to continue. But it is an unmistakable development, visible on scales from millennia to years, from the waging of wars to the spanking of children." 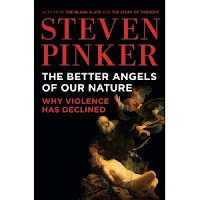 "The very idea [that violence has gone down] invites skepticism, incredulity, and sometimes anger. Perhaps the main cause of the illusion of ever-present violence springs from one of the forces that drove violence down in the first place." "The decline of violent behavior has been paralleled by a decline in attitudes that tolerate or glorify violence, and often the attitudes are in the lead. By the standards of the mass atrocities of human history, the lethal injection of a murderer in Texas, or an occasional hate crime in which a member of an ethnic minority is intimidated by hooligans, is pretty mild stuff. But from a contemporary vantage point, we see them as signs of how low our behavior can sink, not of how high our standards have risen."